The Deathride (aka The Tour of the California Alps) Cometh! Yup, it’s that annual right of passage that takes place right here in the little town of Markleeville, this Saturday, July 14th. The 200 or so residents, including yours truly (and my wife and two felines), will soon be joined by a few thousand others. Thanks to CalTrans (and our local Chamber of Commerce, as well as a bunch of volunteers) the roads are ready, signage is up and most importantly, the port-a-potties are in place. Oh, and speaking of CalTrans…They’ll be doing a bit of rock etc. clean up on Friday so that the roads are as clear of debris as they can be for Saturday. If you see ’em please be sure to thank them. They do a lot to keep our roads in order. Yeah, that’s right. No cars until noon. Sweet! And…no cars on Ebbett’s for a good chunk of time, too. 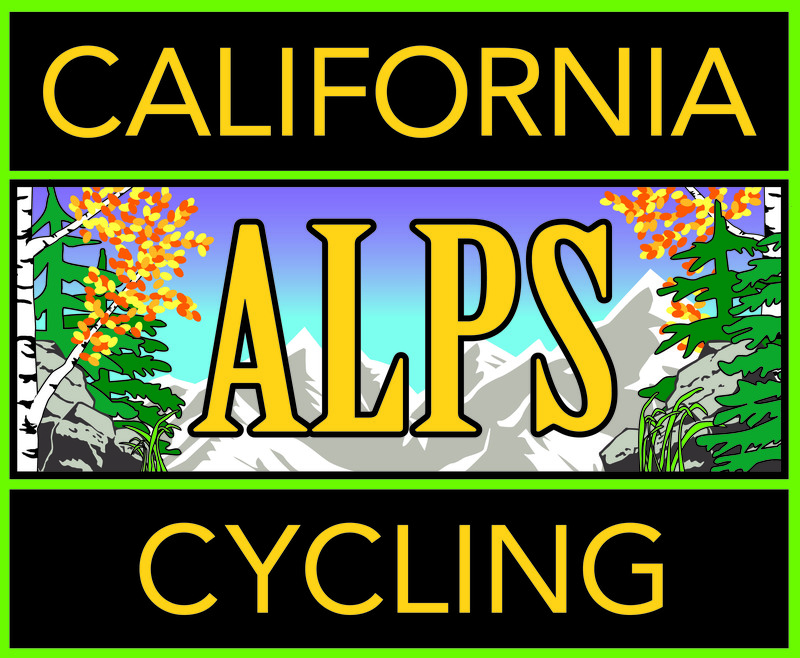 For those of you who’ll be joining me, and other members of California Alps Cycling, we urge you to be safe and obey the rules. Please say thanks to the folks in the town who are supporting (and in some cases, tolerating) us because it is a bit disruptive, you know? For the locals who are putting up with us and our crazy ways, THANK YOU! WE REALLY APPRECIATE YOU! We invite riders, support crews and residents to stop by our booth tomorrow. We’ll have some cool t-shirts for sale and you can pre-order your Castelli CA Alps kit too. The jersey from our CA Alps Cycling kit. And, we’ll be happy to regale you with stories from last year, give you suggestions and answer any questions that you may have. We wish you good luck on your ride and remind you to ride your own ride and remember to have fun and don’t be too hard on yourself. And, when you get to the top of Carson, you can add your name to “the Board” and be memorialized for all time! Yesterday, I left C.A.C. HQ here in Markleeville to hook up with Charlie and James at the top ‘o the pass. They were starting from the Bear Valley side. We all left about 7:30 a.m. and thinking that the mileage for each of us was about the same, 18 miles, we planned on a 9:30 a.m. meet up. ‘Twas a beautiful morning on the pass, with lots of wildflowers (too focused to stop and take pix, my bad) and no wind. The Carson River, Silver Creek and Cascade Creek were all flowing nicely and all crystal clear blue, green and yes, even silver. Our plan came together nicely. As I rose over the last little crest at about 9:40 a.m. I could see Charlie and James waiting for me; they had just arrived and were snapping some photos. Before heading down, we took a few minutes to do the same. Thats Charlie and his trusty steed there on the left, and on the right is James and me. The descent into Markleeville was speedy and fun, especially for me, because I knew I wasn’t going back up after lunch, and it was getting a bit toasty. We all hit the Alps Haus Cafe for some amazing sandwiches and I headed back to HQ to do some much needed chores, while the boyz headed back up the pass and down the south side into Bear Valley. Beauty day indeed! Thanks for the company, gents. One of my favorite things to do here in the CA Alps is to visit the little town of Genoa. It has a dusty, musty, rusty ol’ watering hole, named after the town, and it’s the oldest bar in Nevada; a few great restaurants/cafes, some antiquing and a nice little park, Mormon Station, for picnicing. It’s definitely worth some time and the bloody marys, and the cold beer, at the Genoa Bar can make for a nice little diversion – not necessarily on the bike but hey, to each his/her own, I guess. I’ve been known to partake in a beer or two during a ride. Haven’t tried a “BM” yet but I think I may just have to get that a whirl. So that’s my route, on this somewhat chilly February day. From CAC HQ, up to Woodfords, Diamond Valley, Foothill, yada, yada, yada. Click here for my ride profile etc. (thanks Strava) and you’ll see what I did for your fine-self. OK? …from the Genoa Country Store. As I mentioned, part of this ride includes Diamond Valley, Foothill Rd. and Emigrant Trail. You can add or deduct all or part for a shorter, or less hilly, or both, version of the ride. Diamond Valley, where Snowshoe Thompson (see my December 2017 post) lived, is a fun little diversion, but can be windy (windy’s somewhat redundant here in the Eastern Sierra, I’ve learned). Emigrant Trail, especially coming from Genoa, is a nice little kicker and if you haven’t done the ride from Markleeville to Woodfords than you’ll learn that those little rollers aren’t so little. The altitude in Markleeville is about 5600′ and it’s about 4500′ in Genoa. Temps can vary, as always, depending on time of year but I’ve found that the typical weather apps are pretty good. Wind is generally stronger in the afternoon and generally comes from the West or Northwest. It can scream down those eastern faces so BOLO (be on the lookout) there. In the summertime, thunderstorms can develop quickly and drop a shitload of water in a short time so heads up there as well.